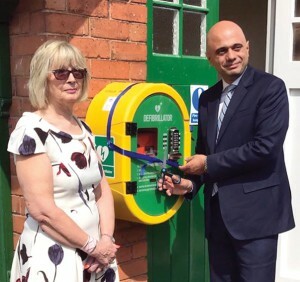 Bromsgrove MP and Home Secretary Sajid Javid officially unveiled the new public access defibrillator at Finstall Village Hall. Rosemarie Ryan, chair of the Village Hall Committee, said: “This is a vital and potentially life-saving asset for the village. “We have worked hard to raise the money and we are very grateful to all villagers who contributed. HSBC, the parish council and the local Scouts also supported the initiative. Mr Javid said he was grateful for the opportunity to support the installation. The defibrillator is a very safe electronic device, designed to be used by a layperson. It automatically reads the heart rhythm of someone who may have had a cardiac arrest, diagnoses whether an electric shock is needed and safely delivers the shock if required. It is registered with the NHS Ambulance Service with access details given through a 999 / 112 call.